There are a few of us in our household who simply enjoy a good board game. Even those of us who do not relish over board games jump in every now and again for a quick game of fun. This summer we were able to add a new game to our collection from SimplyFun . Shape Whiz is not just a game, but an educational tool that builds geometrical skills and speed. Let me start off by saying that it isn't s complicated as it looks, and that our board has yet to be set up correctly. It's not that I think it is hard to set it up as it is pictured above, but I didn't find it necessary since for the most part only my seven year old and I played. Every now and again my ten year old would join us. Shape Whiz is recommended for ages ten and above, but my like I stated I played the game mostly with our seven year old. 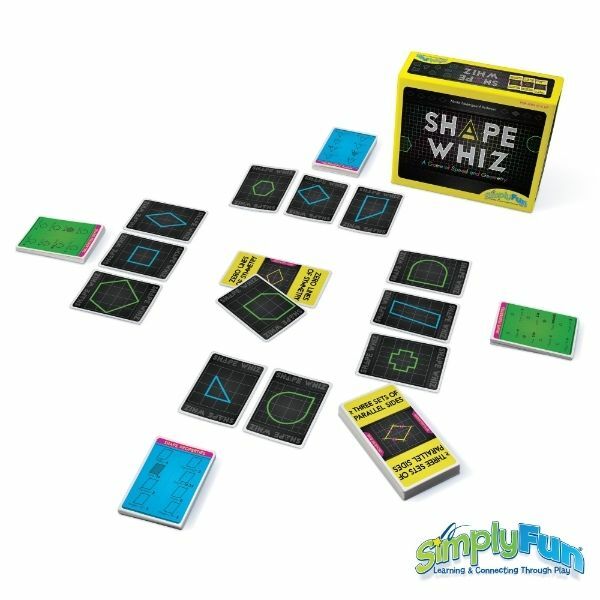 Shape Whiz is a game speed so if you or your child likes a good competitive game this may be one to add to your collection. The large yellow cards offer a description of a shape. The description can be anything from the number of sides, a certain number of angles that are greater than or less than 90 degrees, the approximate area, or even a certain number of parallel lines within a shape. Once a yellow card is in play, the players must quickly lay down a shape card that matches the description. This card may come from the player's set of shape cards or the player may use an opponent's. There's no order when throwing down an accurate shape. The first player who finds a shape that matches the description has one less card, and the person who plays all of her cards ultimately wins the game. The goal is to be quick and correct. Although my daughter is younger than the recommended age, I did not have to adapt the game too much. We only used the shapes on the blue set of cards because they were the shapes that she was most familiar. The shapes on the blue cards were mostly triangles and polygons whereas the shapes on the green cards were more advanced and included a larger variety of polygons, circles, and semicircles. We followed the rules exactly outside of not setting the board up exactly as pictured and having the information side facing up. The black side of the blue cards were expected to be facing up, but since my youngest daughter isn't as quick to calculate perimeter and area, and she doesn't always remember all of the terms we played with the information side (blue side) facing up so that the game would be a little more fair for her. We appreciated the fact the game was rather quick. We could sit down with it a few times a week and play quick round of Shape Whiz. It caused us to think about math without pressure. There was also the introduction of new terms for both of the girls and the review for our oldest daughter. I really appreciated that the information is provided on the back side of the playing cards because it did make it possible for our youngest daughter to also play the game. I don't think she would have enjoyed it as much if she had to know all of the mathematical terms before ever sitting down to play the game.